If there’s anything a genealogist learns after really getting into family history, it’s the need for precision. We don’t say that John Smith Sr. on that 1780 tax list is the father of John Smith Jr. on that tax list just because of the letters after those names. Because we’ve learned that senior and junior back then meant nothing more than older and younger. They might have been father and son, but that’s not why the terms were used. And we don’t say that two people listed one after the other on a census were living next door to each other just because of the order of their names on the enumeration page. We’ve learned that some census records are alphabetical, and some census takers took some very odd routes when calling on the people in their territories. And when we venture into the realm of genetic genealogy, we need to bring that same precision to bear on our work — and it sure would be nice if we could expect the same precision from those in the media who tell us about developments in genetic genealogy. Alas, the Richard III story of last week showed us that we can’t rely even on science reporters — or their photo caption writers — or their editors — to get it straight. So here’s a lesson for The Guardian — a nephew is not a descendant, an uncle is not an ancestor. Here’s a short course in what this non-scientist understands of the science (and I’m sure if I’m wrong somebody who is a scientist will jump in and tell me so!). Somewhere back in time, probably 100,000 to 200,000 years ago, a woman lived somewhere on earth. 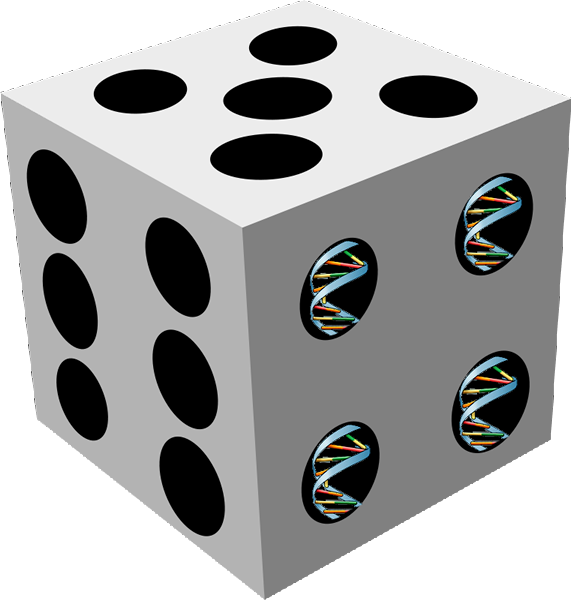 Because of chance — luck on her part, bad luck on the part of other women living at the time, disease, food supply and who all knows what else — her descendants managed to be fruitful and multiply … and the direct female lines of all the others died out somewhere down the line. Anyone whose haplogroup is N shares a common matrilineal ancestor. Let’s call her mtEve-N. And anybody in haplogroup V shares a different common matrilineal ancestor — mtEve-V. Now understand: all these folks are still related to mitochondrial Eve. Not very closely, for sure, but you wouldn’t be here today if you didn’t descend from that woman. But all the V folks descend from a different one of mtEve’s daughters than all the N folks. Within each of these big haplogroups are what are called subclades — and those represent the few additional differences that help distinguish one person in a haplogroup from someone else in the same haplogroup. You can think of that as descending from one of mtEve’s granddaughters. So mtEve had a daughter mtEve-J. And somewhere down the road, she had a daughter mtEve-J1. And somewhere further down the road that daughter had mtEve-J1c and so on. And everybody who is J1c2c descends by definition from whichever of mtEve’s however-many-great granddaughters first passed the defining characteristics for J1c2c on to her daughters. 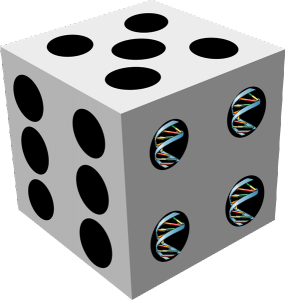 So the bottom line here is that we don’t roll the DNA dice with everybody having a “chance” of ending up with the “same mtDNA.” By definition, if you have the same mtDNA as someone else, you’re related. The only question is how closely you’re related, not whether you’re related. So you’re still related. It just may be that you’re related back in the mists of time, far beyond where there’s even a hope and a prayer of being able to document the relationship on paper. The emphasis, of course, is mine. And the point is, it should have been his. I have encountered a lot of people who use the term “descendant” or “ancestor” when what they mean is that they are related to someone but collaterally only. Sometimes I try to correct them, but it is hard to get through sometimes. The collaterals can be hard to reference, sometimes, Eilzabeth — but that’s sure no excuse for misusing the terms! Maybe we just need better terms for them. Thanks for a good article. I have read quite a bit about my mtDNA matching level but had missed the chart you reference in footnote 11. It makes sense now that of the 14 exact mtFullSequence matches I have, my genealogy back to my GGGrandmother, 4 generations, doesn’t match any of the matches. Any of them could still be within another 12 generations, 300 years. Brick walls a son-of-a-gun to break down. More digging ahead. You did a great job explaining this topic Judy. I sometimes think we spend an awful lot of time as a community fixing intentional or unintentional “misrepresenations” of genetic results. Coming from you, that’s high praise indeed, Roberta! Thank you! Today’s journalists are in such a hurry to print/post something that they generally don’t spend enough time understanding the subject they’re supposed to be talking about. Most higher class media outlets have “fact checkers” but they usually know even less about a particular topic so they can’t catch most of the mistakes that require interpretation of info. I have no idea how to get people to slow down and think. Actually, I have no idea how to get people to slow down OR think! Unfortunate, but often true, Jo. The article appeared in The Guardian, a paper so famous for typos and other examples of sloppy editorial quality control that it was long ago renamed The Grauniad by the satirical magazine Private Eye. My favourite Grauniad typo of all time was a a review of the opera “Doris Godunov”. More recently they published a bar chart showing a £5 billion profit by British bank RBS as a £44.7 billion loss. Oh boy, here we go again: aolbroadband.welcomescreen.aol.co.uk/video/public-offered-dna-testing-to-find-richard-iiis-descendants/517669315/. Take a look at the headline. Sometimes I wonder if newspaper journalists are proud of their complete lack of knowledge on the subjects they write – and not just in scientific questions. This should have been a letter to the editor at the Guardian.